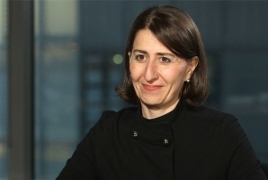 PanARMENIAN.Net - The recently re-elected Premier of New South Wales,Gladys Berejiklian will address the National Armenian Genocide Commemoration Evening on April 24 in Sydney, marking the 104th Anniversary of the Genocide of the Armenians and other Christian minorities in the Ottoman Empire during World War I. Last month, Berejiklian – the grandchild of Armenian Genocide survivors – became the first female to be popularly elected as the Premier of Australia's largest state, after historically leading her party to election victory. The National Armenian Genocide Commemoration Evening is an annual event. It will be held at The Concourse in Chatswood on April 24, is regularly attended by approximately 1,000 members of the Sydney Armenian community, religious, political, NGO, media, diplomatic and academic leaders from across the country.